Dilem glasses are adaptable to each person's taste. 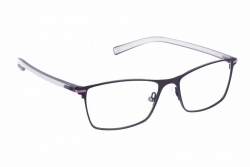 Besides this, Dilem frames have interchangeable temples that allow to change between many colours and patterns. Furthermore, the temple's principal component is an ultra resistant polymer. This collection is for all those who are looking for different, original glasses. Dilem is for all kind of public; women and men that look for a simply different design. In fact, they are products always up-to-date with new tendencies.